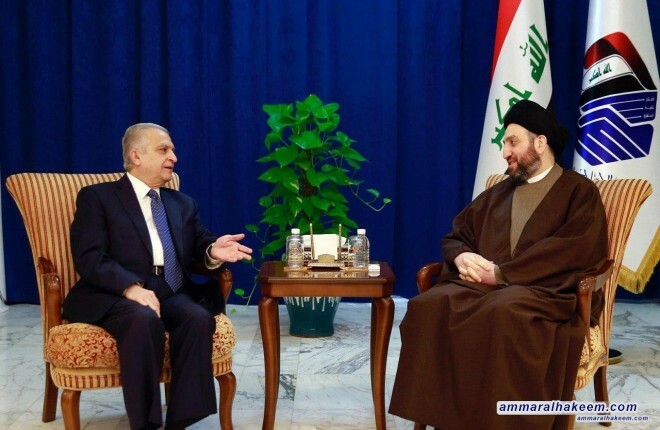 Head of the Reform and Reconstruction Alliance, Sayyid Ammar al-Hakim, in Baghdad, received Iraqi Foreign Minister Mohammad Ali al-Hakim, and discussed latest developments in the Iraqi, regional and international political situation. His eminence stressed on the importance of exploiting the status of achieved victories in strengthening Iraq's standing among the world's countries. His eminence called for active presence of Iraq in all aspects, to serve the interest of Iraq, plus providing care of the Iraqi communities and activating the role of embassies abroad for all Iraqis. His eminence stressed the importance of hard extensive work for a pivotal return of Iraq in international organizations and regional bodies, stressed on the unchanged position of Iraq regarding key issues of the Arab and Islamic nation , pointed out the need to distance Iraq from the policy of international and regional axes, and launch relations with all on the basis of common interests.